My Skin Secret (It’s Under $4). I thought I would let you in on a little bit of a secret… It’s a little product I take daily to ensure I have glowing skin and great overall health and pssst it’s so damn affordable. About a year and a half ago I had my makeup done by the amazing Eco Make-up artist Emmily Banks of Depths Of Beauty (Sydney based). We clicked straight away and we shared similar views on life, health and lifestyle. Even though I maintain a healthy life I still learn so much from others practicing a similar approach. Emmily told me that she wasn’t feeling well that morning and that she took a spoonful of turmeric as it is a herbal remedy with anti-inflammatory and therapeutic properties. I was so intrigued at the thought of a spice having healing properties and as soon as our shoot had finished I was straight on Google looking up this spice where I found out it was a part of the ginger family and native to southeast India, it has long been used in both Chinese and Indian medicine. Until then I thought it was just another ingredient in curries – I was so ignorant to the fact it may have had more benefits.I guess I’ve always just been healed with antibiotics when I have had a cold, so I haven’t questioned it. It’s so great there are other methods. From that day forward I know think it is so important to try natural remedies before any medical options or in conjunction with what your doctor sees fit for your illness. Turmeric has been used as a beauty product for centuries and it is still used in cosmetics and skin care products worldwide. Turmeric helps to naturally slow the appearance of aging and restore youth. Continued use decreases the formation of deep creases and wrinkles. But these benefits aren’t the only reason take turmeric daily. 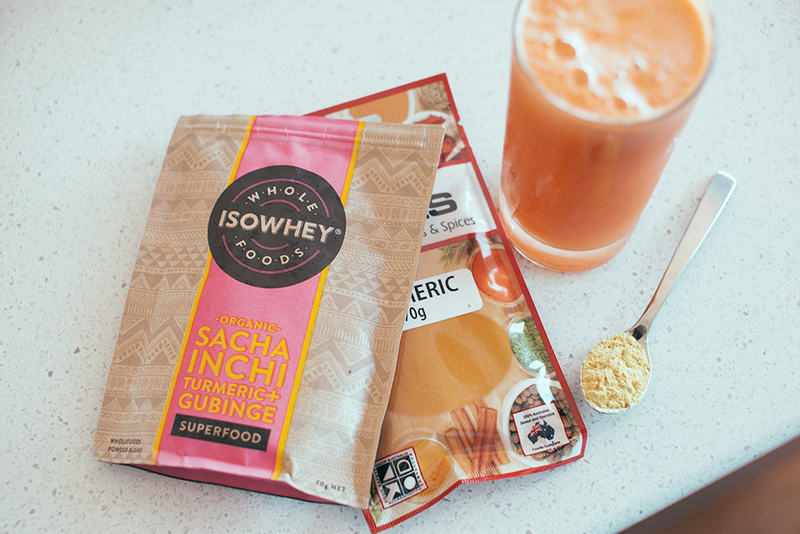 When I make a fresh juice or have a protein powder post work-out I pop in a heaped teaspoon of Turmeric or my IsoWey Super-foods Organic Sacha Inchi, Turmeric + Gubinge Powder. The latter has a bunch of other great super-foods in it, but if you are just after Turmeric, you can pick that up from your local health food or general store in the spice aisle! 1.Treats skin imperfections, acne and other pimples! Turmeric is effective in the treatment of acne due to its antiseptic and antibacterial properties which fight pimples and breakouts to provide a youthful glow to your skin. Turmeric can help lighten stretch marks. For this purpose, apply a mixture of besan (gram flour) and turmeric with yoghurt/raw milk/ water on the stretch marks. Turmeric is a natural anti-septic and thus, is effective in treating skin conditions like poison ivy, eczema and psoriasis. Topical application of Turmeric mixed with milk is a great was to reduce redness and inflammation. 5. It helps us ladies at that time of the month! Turmeric extracts or bitters when taken twice a day daily for two weeks prior expected menstruation cycle will help reduce the monthly menstrual cramps in ladies. When taken as supplements, it also aids in reducing joint pains. 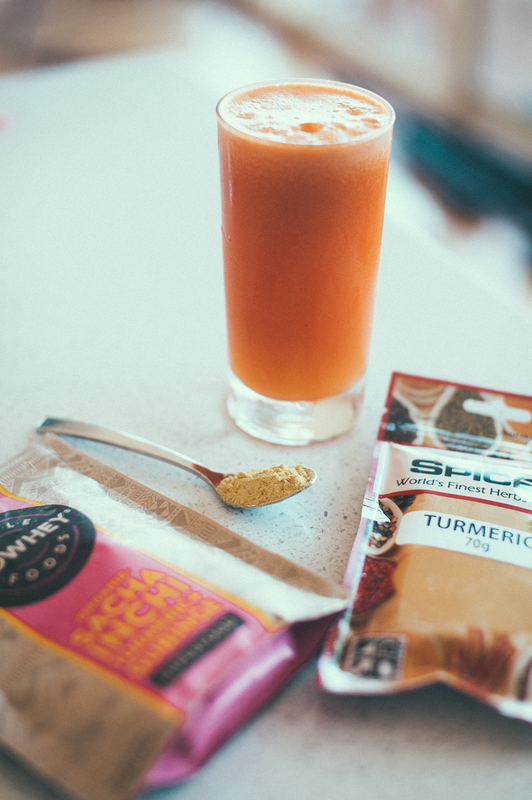 Turmeric is great for the immune system, so be sure to add it into your meals in Winter! Completely love your blog Ally. You can’t go wrong with a bit of turmeric, I used to put it in my ‘go to’ homemade face mask but definitely going to start using it more often. Thanks so much Alexa! Love your blog too! I haven’t tried it in a face mask yet! I must do.